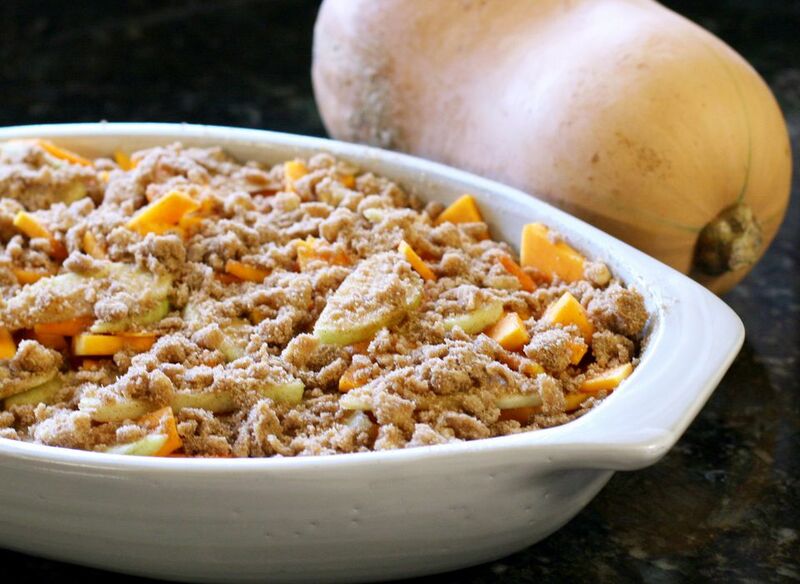 This crumb-topped butternut squash casserole is made with a combination of sliced butternut squash and apples. The apples complement the squash perfectly, and the simple crumble topping, lightly spiced with cinnamon and nutmeg, is the perfect finishing touch. This is an excellent side dish for any fall meal, and it would be a perfect Thanksgiving or holiday dinner casserole. Pecans would be good in the topping as well or use chopped walnuts. It's a good lower carb alternative to a crumb-topped sweet potato casserole, too. Or add it to your menu along with a sweet potato dish. You can make this casserole with other types of winter squash as well. Hubbard squash, acorn squash, and sugar pumpkins can be used as a replacement for butternut squash in any recipe. Butter a 2- to 2 1/2-quart baking dish. Peel, seed, and cut squash into small slices. Core the apples, peel, and cut into thin slices. Toss squash and apples together. Transfer squash and apple slices to the prepared baking dish. Combine brown sugar, flour, salt, cinnamon, and nutmeg; cut the butter in with a fork or pastry cutter until crumbly. Sprinkle crumbs evenly over sliced squash and apples. Cover the casserole dish tightly with foil and bake in the preheated oven for 50 to 60 minutes, or until the squash is tender. To peel a butternut squash, use a sharp chef's knife to cut off the ends of the squash. Hold the squash in one hand and use a sharp vegetable peeler to peel the squash. Place the squash on the cutting board on its flat bottom. Starting at the top, carefully slice it in half with your chef's knife. Scoop out the seeds and scrape out the loose stringy pulp. Slice each half in half again (lengthwise) and then slice each piece crosswise. Add chopped pecans or walnuts to the crumb mixture. Substitute sliced pears for the apples.